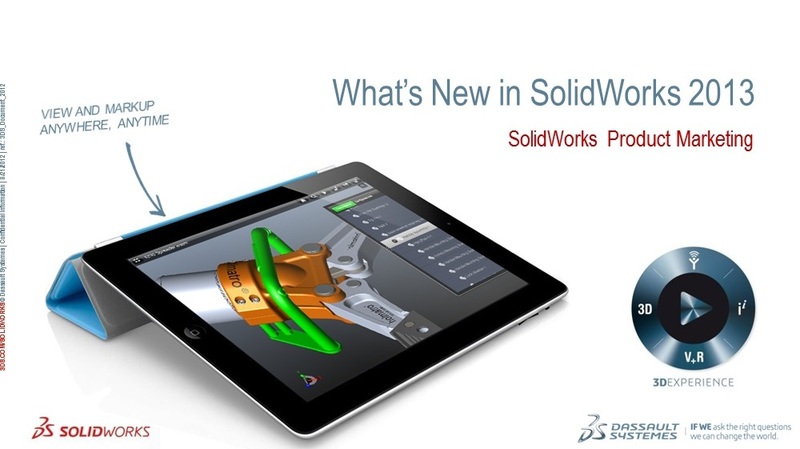 SolidWorks 2013 is the 21st release of our flagship 3D CAD software – an exciting release packed with new products, new features, and productivity enhancements that translate into real benefits. Each year, we receive thousands of enhancement requests from the growing community of SolidWorks users, suggesting ways to automate common tasks, streamline design processes, or provide custom tools for specific industries. This is valuable feedback and provides insight into how our products are used and ways in which we can provide real process improvements and real business benefits, for you. SolidWorks 2013 builds upon the production proven technology used by thousands of designers and engineers every day. 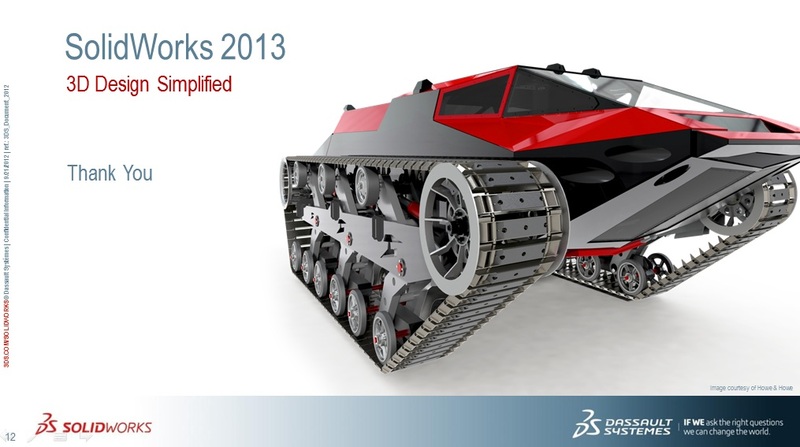 With SolidWorks 2013 you can finish your design projects quicker with higher quality and less rework. You can integrate more design disciplines, collaborate with colleagues easier, and validate quality up front while keeping an eye on costs. 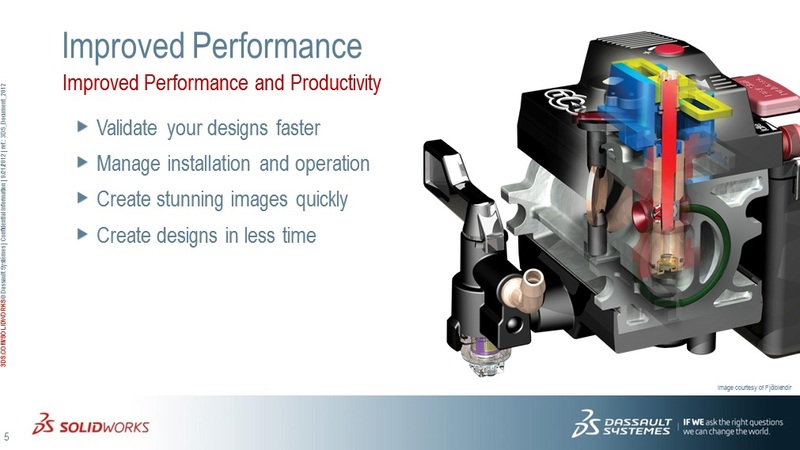 Continuous improvements to graphics performance and multi-core processing deliver tangible productivity gains and time savings. 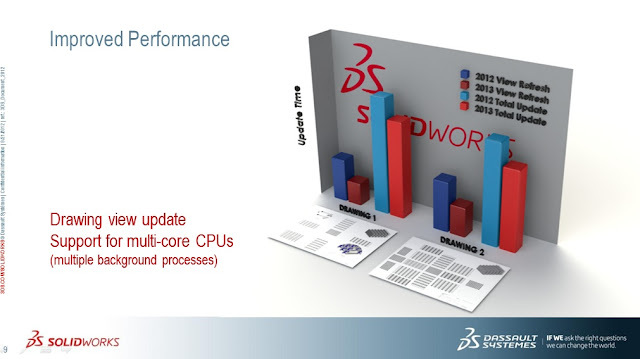 SolidWorks 2013 – 3D Design Simplified. Two brand new product offerings help you to improve plastic part quality and integrate electrical and mechanical designs. Existing tools like SolidWorks Costing and SolidWorks Sustainability also deliver significant new enhancements to help you achieve your design and cost goals. SolidWorks Plastics provides powerful mold filling simulation capabilities for designers of plastic parts and injection mold tools. You can evaluate manufacturability and improve your final product quality early in the design process, when you have the most flexibility. Manufacturing related defects such as weld lines and sink marks can be easily visualized and by simply making changes to the part design, mold design, plastics material, or processing parameters, you can quickly arrive at the optimum design while saving energy, natural resources, time, and money. SolidWorks Sustainability helps you understand the environmental impact of your design. It provides a fast and intuitive way to evaluate how aspects such as design changes, material choices, or manufacturing location impact factors like carbon footprint and energy consumption. A key new capability in 2013 is the ability to evaluate raw material cost factors when you compare designs and lets you integrate the results into the design documentation. SolidWorks Flow Simulation has helped customers across many industries to understand the fluid and thermal performance of their designs to ensure they meet their needs. 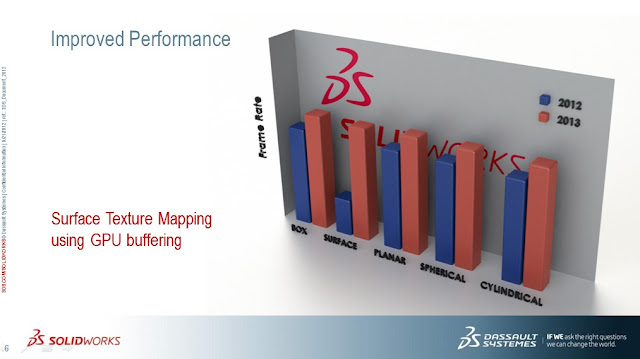 SolidWorks Flow Simulation 2013 provides added tools to compare design performance, identify problems in the model, and refine the design. 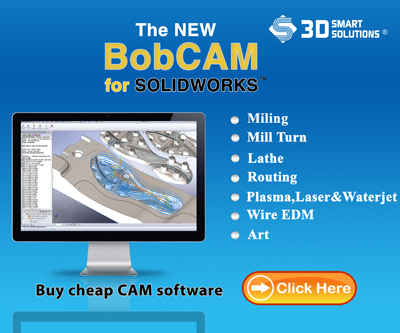 SolidWorks Costing provides the ability to estimate the manufactured cost of machined and sheet metal components. Machined features have been extended to support turned components or components created on multi-axis mill/turn machines as well as estimating the manufacturing costs of multi-body parts. Simplify and streamline your electrical system design and seamlessly integrate your electrical schematics and mechanical systems with SolidWorks Electrical – a new product that enables quick design and integration of your electrical systems, including single- and multi-line schematics creation, automatic bi-directional linking between 2D schematics and 3D models, automatic wire routing, and integrated BOMs. 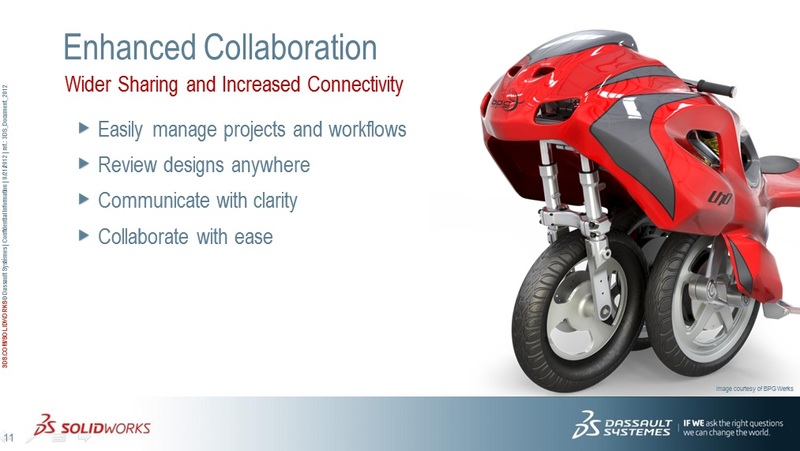 With SolidWorks 2013, core functionality continues to be enhanced to allow you to create 3D models more efficiently and automate your 2D drawing tasks. With the new sketch conics, intersect tool, and varying dimension patterns you will be able to create more stylized parts and have better parametric control over patterned features. Holes and fasteners have also been enhanced to allow creation of standards-based dowel holes and to ignore interferences on threads. Support for multi-body library features when creating models such as weldments makes it much easier to reuse standard items like plates. Many enhancements have been added to 2D drawings to automate many detailing tasks such as balloon re-sequencing, automatic layer assignment, and more predictable behavior with radial dimensions. 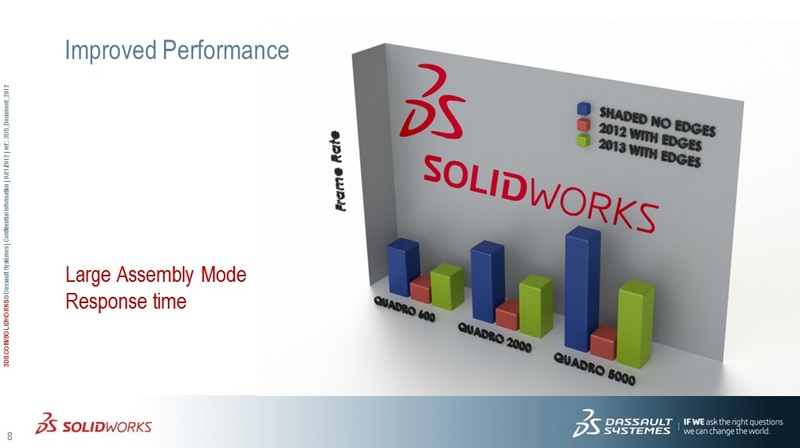 With SolidWorks 2013, performance has been improved in many areas, increasing productivity and getting more out of your existing hardware. 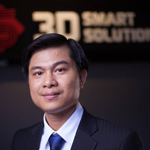 Simulation 2013 introduces sub modeling; an innovative capability that enables users to take loads from a large model onto localized areas of a design to obtain high quality results just in the areas of interest. Speedpak enhancements along with general assembly improvements make working with large designs easier than ever. 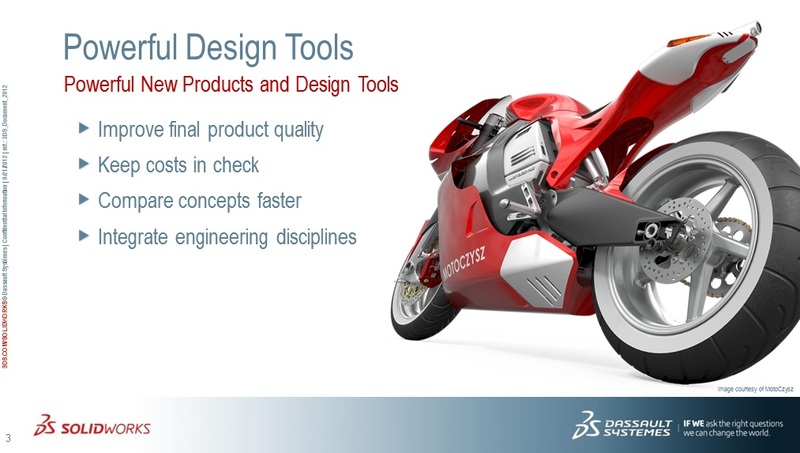 Usability enhancements added to SolidWorks 2013 make everyday tasks more streamlined saving time and effort. The new view selector and Center of Mass tools increase productivity and give more feedback to the designer during the design process. PhotoView 360 introduces network rendering, new appearances and new image processing tools to get your final image looking just right in less time. Diagnose and troubleshoot hardware and software on workstations in your company, using the CAD Admin Dashboard. This adds another level of support, enabling your systems team to find bottle necks that can affect end user productivity. When it comes to performance improvements, even small speed ups can have a big effect. When you use SolidWorks all the time, reducing the time it takes to perform a frequent task has a cumulative impact in helping you get your job done faster. Let’s take a look at some key improvements. Over the past several releases, SolidWorks has made some great improvements in graphics performance by utilizing the graphics card for RealView rendering tasks. Appearances that use surface mapping require a lot more rendering information than other techniques such as box, planar, or cylinder appearance mapping. This can cause a significant performance hit when interacting with the model. 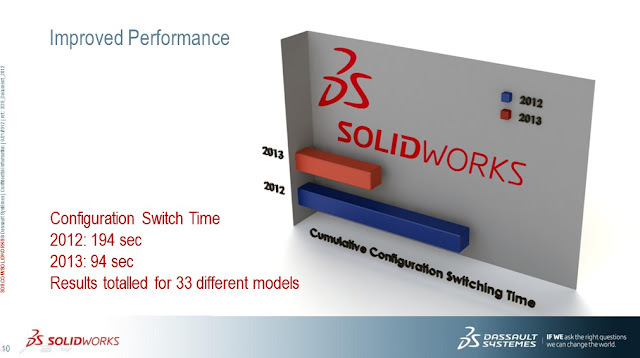 In SolidWorks 2013, this rendering technique has been reworked to give consistent graphics performance no matter what appearance mapping method you use. Another graphics area that can slow down performance on large assembly models is “shaded with edges” – there was a significant drop in the response time compared to displaying your models with the edges switched off. By utilizing the GPU on the graphics card for edge rendering, a significant performance improvement has been achieved in SolidWorks 2013, especially in Large Assembly Mode (see next slide). Drawing view updates now take advantage of multi-core processors. Multiple background processes are launched to update drawing views in parallel instead of sequentially. So for drawing sheets with lots of views, the update time is significantly reduced. When you make a change to a model configuration and then switch to a different configuration a delay sometimes occurs while the model is updated even though nothing changed in the other configuration. In SolidWorks 2013, the time it takes to switch configurations has been cut significantly especially on larger models with longer rebuild times. By taking advantage of the same technology behind feature freeze, updates now only occur when changes impact the selected configurations. This applies to both parts and assemblies. Collaboration is now easier than ever. With SolidWorks Enterprise PDM 2013 you can now chat, e-mail, or call your colleagues with just a simple click. The redesigned workflow interface gives you more control over document routing, making your design processes faster and easier to manage. You can collaborate anywhere, anytime with eDrawings for iPad, and with previous release interoperability you can share designs with others who have not yet upgraded to the latest release. Communicating designs is made clearer with 3DVIA Composer with additions like magnetic lines that snap to geometry and the new image library for reusing and sharing common assets.